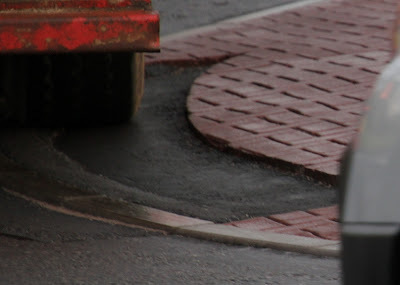 Dave W, who has contacted us previously on issues connected with this roundabout, is not at all impressed with the way the surface of the inner part of the roundabout has been left after recent works. Dave reckons it amounts to two potholes for drivers at two points behind drains. In the picture you can see the end of a lorry as it passes over one of the points concerned. It certainly is a bit of a dip (picture will enlarge). Take care on the roundabouts gurnites, perhaps the work isn't completed yet and Bear Scotland might be coming back to put in a few red bitties? the magic roundabout is invisible i think as most lorries go over the top of it from what i have seen, it is far to tight for them. I know that The Gurn has to be cautious regarding what it publishes & has restricted some of the comments I have made in the past regarding the construction & materials used on the Sainsbury's roundabout which I fully respect but looking at how much work that has had to be redone now on a regular basis does the facts now speak for themselves & truth be known that they have made an almighty balls up which now must each time cost a small fortune to rectify at a time when money is tight. Never mind the roundabout, the puddles in Sainsbury's car park are now so big I suspect all Joe's swans and dusks will take up residence any day soon! With respect to the roundabout and standing water in the car park, there are some contractors who are very professional, and others who are not. Enough said. We still also have huge problems with the state of the footpaths alongside the A96 in particular the block paved sections across the river bridge and from the roundabout at King St up to Leopold St. Not to mention the resurfacing works carried out last summer by BEAR themselves, during which none of the ironwork was raised, resulting in effectively 1 inch deep obstructions at some of the manhole covers and surface boxes, deadly for cyclists. Not good enough.